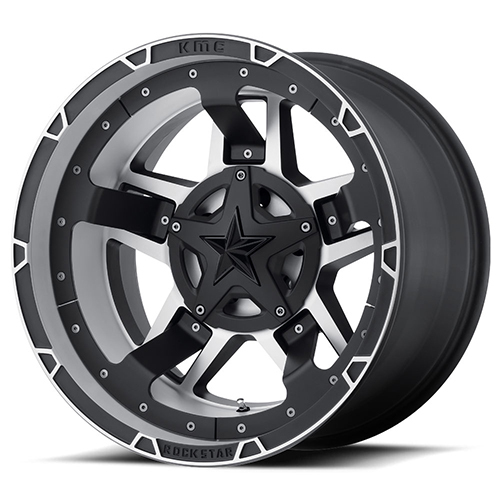 All Star Motorsports offers these Rockstar by KMC Wheels XD827 Rockstar 3 Matte Black Machined With Black Accents 20x9 6x135 6x139.7 -12 offset 106.25 hub wheels at a great price! These Rockstar by KMC Wheels XD827 Rockstar 3 Matte Black Machined With Black Accents 20x9 6x135 6x139.7 -12 offset 106.25 hub wheels are available in a variety of sizes and finishes and along with great style, they offer some of the best quality in the market. You can also combine these wheels with a large selection of tires to make this a complete All Star Package! All of our wheels are shipped free to your door and are individually inspected and professionally packaged to ensure your order arrives without any damage. All packages include free mounting and balancing, along with a free set of locks and lugs! Don't know if they will fit? No problem! Let our fitment experts worry about that. Just give us a call and let us know what the year, make and model of the vehicle is and we can recommend the best fitment possible. Why go anywhere else when you can have an All Star at your side!